Noiiz announces new subscription pricing and features, and launches Noiiz Studio Competition! The first soundware label in the world to offer an ‘all you can eat’ subscription service, Noiiz launched at the beginning of this year to immediate acclaim from press and public alike. Noiiz’s constantly expanding cloud-based library of royalty-free samples - produced by Samplephonics and a roster of guest ‘Creators’ - gives musicians and media producers access to a goldmine of creative tools, without the need to commit their budget to one pack at the expense of all others. Now, six months after its inception, Noiiz is recalibrating its pricing structure, adding some major new features and kicking off a truly incredible competition with a prize pot totalling over $5,000 in value! As of July 4, 2017, a Noiiz Unlimited Subscription, granting unfettered access to over $10,000 worth of content (if bought separately), will cost just $9.99/month, or $99/year. That’s almost 50% lower than the previous price, with no catch and absolutely no reduction in what you get for your money. Not too shabby! Although details are yet to be made public, Noiiz is also promising new features for both its web application and cloud-connected plugin. Not least of these is the new Presets section, where patches for a wide array of virtual instruments and effects can be downloaded as part of the Noiiz Unlimited Subscription. 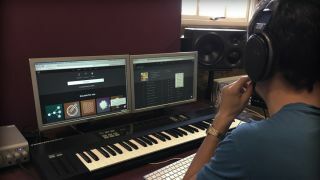 Five runners-up will each receive a copy of Ableton Live 9 Suite, while ten further runners-up will receive a one-year Noiiz Unlimited Subscription. Applying the same pricing model to the soundware industry that Netflix and Spotify have in the world’s of movies and music, Noiiz aims to disrupt and delight in equal measure. Offering unlimited downloads from a huge library of samples and presets for an unarguably bargainous $99/year, it clearly has a major role to play in the future of music production. Sign up today at www.noiiz.com.